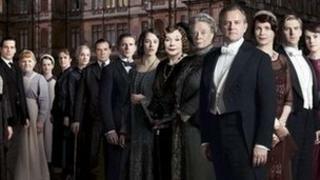 Image caption The first episode of Downton Abbey premiered on Greek television on Monday. Greek state television has been criticised for cutting out a gay kiss from British drama Downton Abbey. The scene involved a kiss between a visiting duke and Downton's footman Thomas Barrow. Viewers complained about the edit on social networking sites, while the country's main opposition party called it "an obvious case of censorship". The NET channel said it removed the scene to comply with parental guidance viewing rules. In a statement, the Syriza party described the omission as "an extreme act of homophobia and discrimination which... we cannot characterize as unprecedented". The episode in question premiered at 22:05 local time on Monday night. Greek state television defended the edit, saying it was not an act of censorship and that the full episode would be broadcast on Tuesday night. "The love affair between the two men... was not censored," said Costas Spyropoulos, managing director of the Hellenic Broadcasting Corporation. "The kiss was not shown because of the time the programme was broadcast and the corresponding parental guidance warnings," he added. There has been a rise in hate crime and right-wing extremism in Greece, where the faltering economy has left many people out of work. A national election in June brought the ultra-nationalist Golden Dawn party into parliament for the first time in history, coming from nowhere to win 18 seats. Demonstrators, including Golden Dawn lawmakers, clashed with police outside a theatre in Athens last week as they objected to an American play that depicted Jesus and his apostles as gay.